DIY Crochet Beanie Hat Free Patterns For All Ages. Crochet Beanie Hats are perfect for unisex at all ages and never go out of style. Our Crochet Channel is going to share a wonderful collection of beanie hat with crochet patterns free to keep you busy and cozy this coming season. They keep your head and ears warm in the winter or cool in the summer, they cover up a bad hair day, and they add the perfect finishing touch to an outfit. Crochet hats can protect your hair, scalp, and ears from the sun’s harmful rays and keep the light out of your eyes, too. Keep your baby’s head warm in cool weather with a snug little cap. You can make any of these patterns because they are especially for beginners, who are new to crochet. Even if you are an experienced crocheter, these beginner hat patterns will be a snap to make for any occasion. 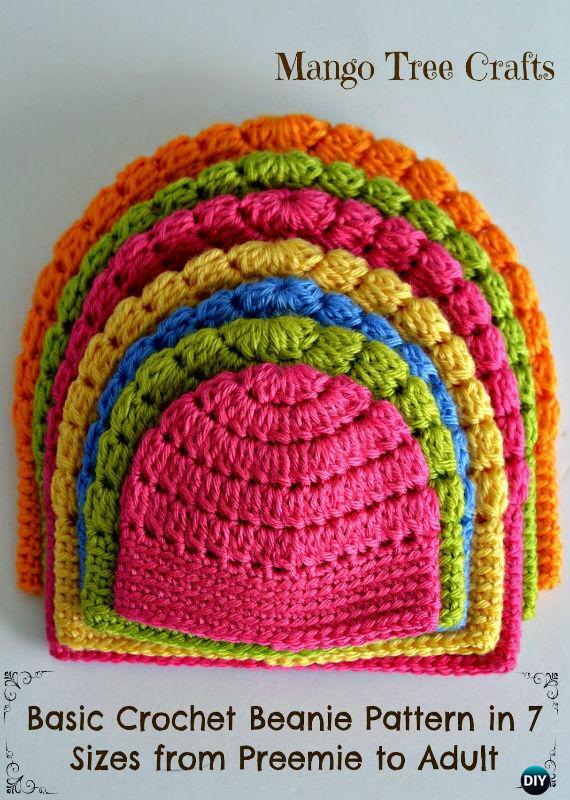 Scroll down and adjust the size to crochet for your whole family with all free DIY crochet beanie hat patterns below. First of all, adjust the sizes follow the crochet size guide from Lilia on Mango tree crafts for all the members before you start your project. nevla; and Free Pattern: Patterns for Crochet UK.